Fluted gown features a corset bodice made of beaded Guipure lace. Flirtatious fit and flare crepe gown with a cascade of 3D couture flowers which envelop the shoulder and around the backside of the dress. A beautifully plunging neckline adorns the back. Strapless gown made of silk crepe, features an asymmetrical neckline and fluted skirt. 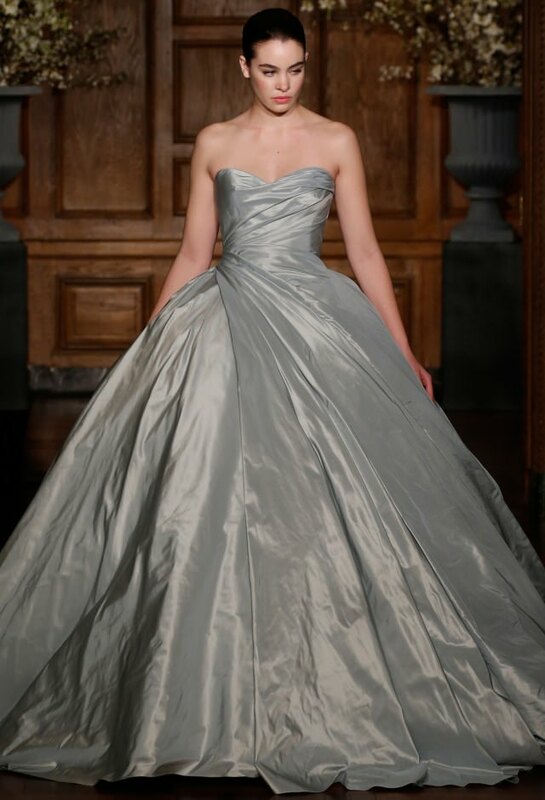 Strapless sweetheart Silk Taffeta ball gown. Gown accented with rhinestone buttons to waist. Silk crepe gown, features an asymmetrical one-shoulder bodice, slim column skirt and transparent tulle overskirt. Gown shown with a silver asymmetrical metal belt sold separately. Flirtatious open back tulle gown with a halter neck. 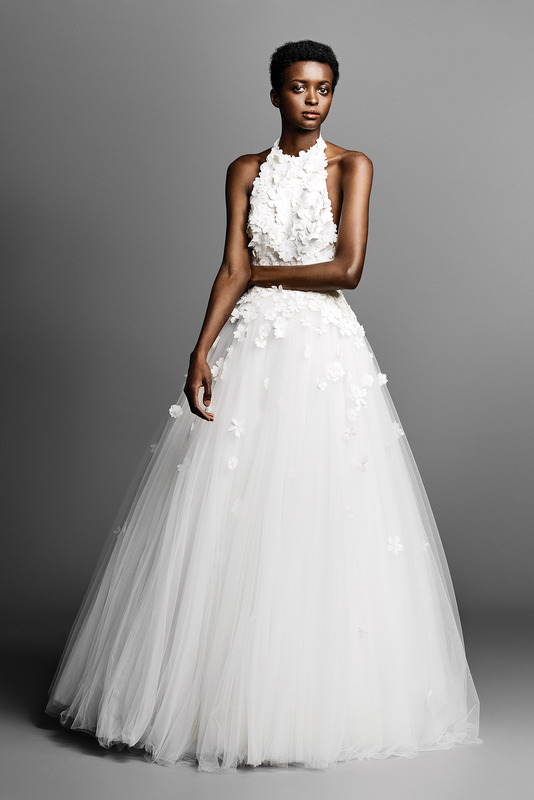 Flower appliques cover the front of the bodice and sprinkle down the length of the skirt. Signature bow detailing is integrated on the back of the neck and waist. Flattering fit and flare gown with sweetheart bodice featuring beautifully arranged flowers along the neckline. This dress is complemented with a detachable bow belt. Modern strapless column gown with beautiful draping that indicated a trompe l’oeil wrap effect. The front of the dress boasts a hidden slit where the wearer’s leg can be subtly revealed. This signature gown features outstanding draped bow back detailing with an oversized dramatic bow that drapes into a standout asymmetric train. Playful 60’s inspired mini dress with a fitted front bodice and flared back. This sweet ensemble is adorned with a 3D couture flower in the bodice. Flirty fit and flare gown with detachable puff sleeves crafted in a crisp organdy. 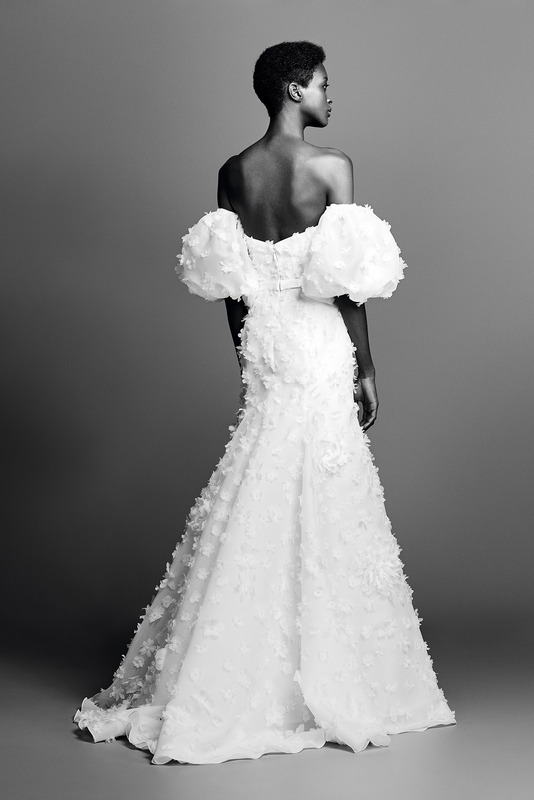 3D flowers adorn the entirety of the gown. Modern pantsuit with a dramatic twist. Featuring a beautifully draped bodice and voluminous pant legs with graphic pleats. A signature wrapped bow adorns the front.